Hello and welcome to another Tuesday Morning Sketch challenge. This week we're working on sketch #457 which was designed by our own Melissa. This week there's a prize of a grab bag of embellishments you're really going to love! I chose a piece of glittered dsp for my background, adding blue, green, and yellow embellishments to coordinate with the color scheme. 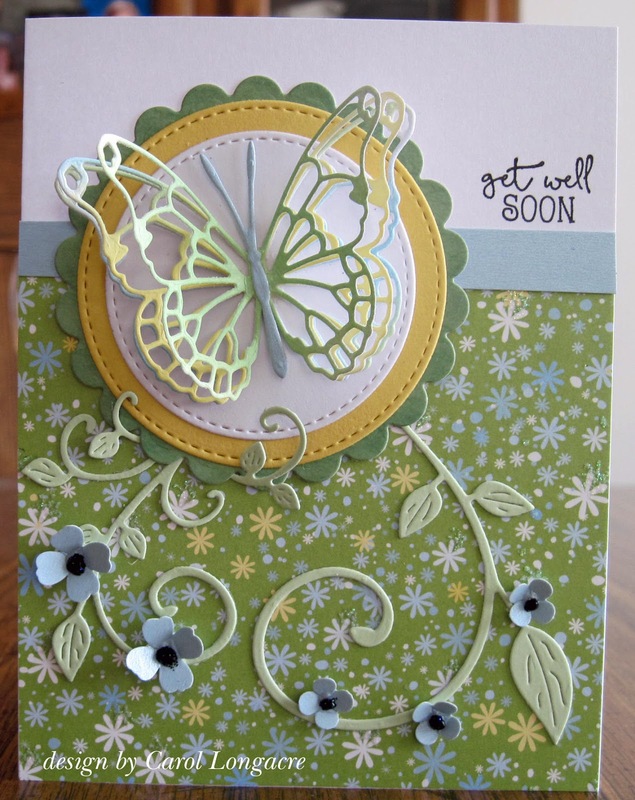 The MB butterfly was cut 3 times and layered on stitched circle dies by MFT and a scalloped die-cut panel by Spellbinders. The flourishes are by Cheery Lynn and I added some small flowers done with SU! mini punches, adding black gemstones to the centers. The sentiment is by Taylored Expressions. After Mrs. A left a comment letting me know my card can be linked to her Butterfly Challenge #101 to spin the wheel with the letter M, I'm entering it there as well! You spin the wheel and choose some or all of the elements to make your card. Have fun and I look forward to visiting your blogs to see what you create too! Such a beautiful card, Carol. It is sure to brighten up someone's day. Great take on the sketch. This is fabulous Carol, a lovely butterfly and pretty papers - a beautiful card. Carol, your card is stunning! Love that awesome butterfly and the design paper is so pretty. Great sketch challenge once again. Great interpretation of the sketch, love the colours you've used. A Beautiful and Summery card, love the paper and your dies. Great take on the sketch. Oh what a pretty card Carol and I think you might have some of the colours of my butterfly wheel if you want to play along with my latest challenge # 101. Hugs Mrs A.
Gorgeous layered butterfly on the beautiful scallop topper! Beautiful papers and fabulous look with that swirl and the tiny blue flowers! Your really created a wonderful card with so many pretty elements added. A great take on the sketch I might add! Absolutely beautiful card! I love the colors and layers. You know I sat down with this sketch yesterday and made two cards, neither of which turned out similar enough to the sketch to enter. I may try again. I’m not sure what my issue was! Thankyou for coming and spinning the wheel. Hugs Mrs A.
OMG this is just beautiful, gorgeous -PERFECT!! LOVE LOVE love this card. I love the colors and that delicate butterfly. Gorgeous card!! I love the fancy die cuts! !